Richard Bartle – Player Types.. 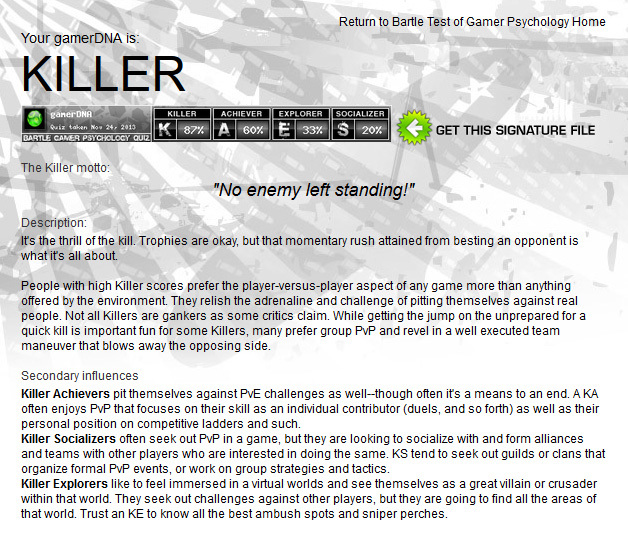 Killers – They like the competition of killing and defeating other players. Achievers – Prefer to gain points, levels and equipment. Explorers – They like to explore the maps and find all the secrets, a player who enjoys finding glitches and hidden Easter eggs. Socializers – They prefer to socialize with other players during play. These player types are what define gamers in a MMO game and most players will lean more towards one section then the others. This is shown in the online Bartle test I did as it shows I lean more towards the killer type of player then the others but also scored a high percentage in the achiever section.. But the original four player types is more well known. ← Project Paragon – Update..